Over the past half year, we've been closely tracking the Dominican media, seeing clear signs of involvement by Washington's elite in a plot to do away with the island nation's sovereignty, creating a new American state with the Dominican Republic's neighbor, Haiti. The evidence clearly pointed to the Clintons, who'd taken trips to Haiti to meet with former voodoo strongman "Baby Doc" Duvalier, thereby essentially making a pact with the devil himself. We warned that Hillary's plan was to do away with the Haitian border, letting Haitians flood Puerto Rico via the Dominican Republic, thus creating a new refugee crisis of unforeseen proportions in the Americas. 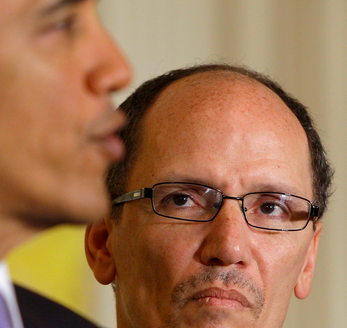 And just today our nightmares are coming to fruition, with the mainstream media floating the possibility that Thomas Perez, Obama's main Dominican crony, could be Hillary Clinton's running mate. The Guardian reports that, not surprisingly, Mr. Perez has come out against deportations, hoping that Congress will "pass comprehensive immigration reform in the next year," thereby indicating that he's completely out of touch with the American people's desires to protect the border and our sovereignty. Although Mr. Perez is of Dominican descent, he has had no actual connections to the island for several decades, and will certainly side with current proposals floating around Washington to fuse the island of Hispaniola, of which Haiti and the Dominican Republic form part. When Hillary Clinton and Thomas Perez are finished with America, there won't be 50 stars on the American flag, the Dominican people will speak creole, Puerto Rico will be a US state, the island of Hispaniola will be a US commonwealth, 11 million undocumented will be on a path to citizenship, and the Mexican border will continue being wide open to the cartels. A decade from now, we may no longer even recognize America's large cities, as the demographic shift will be so drastic that entire school systems will buckle under the influx of illiterate Haitian nationals and destitute Dominicans.